"Build a dream and the dream will build you." REPRESENTING LOUISIANA AS MRS. LOUISIANA INTERNATIONAL 2013! Laura Valenti is an advocate of many causes, a dignitary for married women in their quest to balance love, life, and family, and a role model to young women around Louisiana representing that confidence, career and education can take you to all corners of your bucket list. Pageantry is a process of personal development. 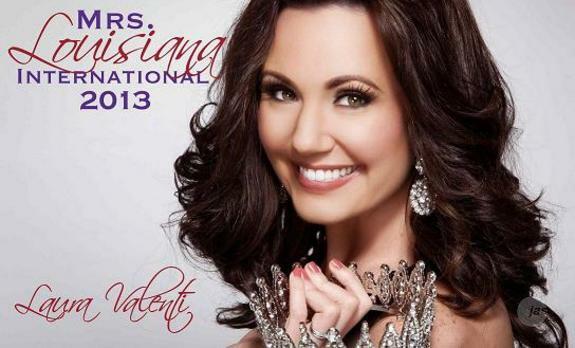 Join Laura in her reign as Mrs. Louisiana International 2013! Email mrslouisiana@gmail.com to request an appearance. The secret to your success is you! Targeted to women as they begin their careers, SHE-Selling workshops and speaking engagements teach participants skills and attributes that magnify personal marketing skills. SHE-Selling is Laura's official platform. She works to instill confidence and ability to career starting women, giving them the opportunity to be their personal best. Visit the website at www.SHE-Selling.com for more information!